NEWBERG, Ore. – Years of behind-the-scenes work by Dean Bob Harder and his colleagues in George Fox University’s engineering major have paid dividends, as the program has been accepted into the Kern Entrepreneurial Engineering Network, a group of 30 institutions nationwide committed to collaboration and dedicated to teaching Entrepreneurial Minded Learning (EML). George Fox is one of only four KEEN member schools on the West Coast, joining Santa Clara, the University of Portland and Gonzaga. The institution was accepted into the network this year along with Ohio State University.George Fox is one of only four KEEN member schools on the West Coast, joining Santa Clara, the University of Portland and Gonzaga. The institution was accepted into the network this year along with Ohio State University. 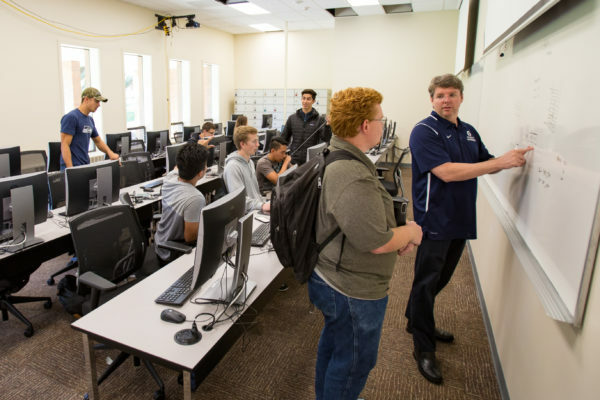 Ultimately, this not only puts George Fox in elite company, but it represents the school’s commitment to upholding KEEN’s mission – to teach a technical skillset and an entrepreneurial mindset, fostering curiosity, connections and the creation of value.